Southwest...The Little Quadrant That Could: 9:30 Club Operators to Run Wharf Center? Bob Rubenkonig of Hoffman-Madison Waterfront said his company is working with the 9:30 Club with the hopes of bringing a music venue to the Southwest Waterfront site, though he didn't offer many details on the project while speaking on a panel Tuesday at the International Council of Shopping Centers Mid-Atlantic conference. "We think it will be a terrific traffic generator." Rubenkonig said. The Wharf Center will be a 135,000 SF multipurpose entertainment and cultural venue on Parcel 2, located near the Maine Avenue Fish Market at 9th Street and Maine Avenue. Wrapped around it will be 494 mixed income apartment units in two towers (292 units in the east tower and 202 units in the west tower), and 39,000 SF of ground floor retail. In addition, there will be a Combined Heating and Power Facility (CHP) that will provide all the necessary heating, cooling, and electrical power sources for The Wharf northwest of 7th Street. More info on what's planned for Phase 1 can be found here. Bob Rubenkonig of Hoffman Madison Waterfront thinks the 9:30 Club will be a "terrific traffic generator" when the company has already admitted in ANC meetings there is inadequate parking for the number of seats planned for the venue. Where are they planning on putting all that traffic? Also, where are the 494 units going to park? How are they going to feel about living over a space that will be filled with thousands of boxing, tennis and rock fans nightly? We've been told that the L'Enfant Plaza garage is the single largest parking facility in the District, and has more than enough walkable-to-The Wharf available parking spaces in the evenings to accommodate the crowds. 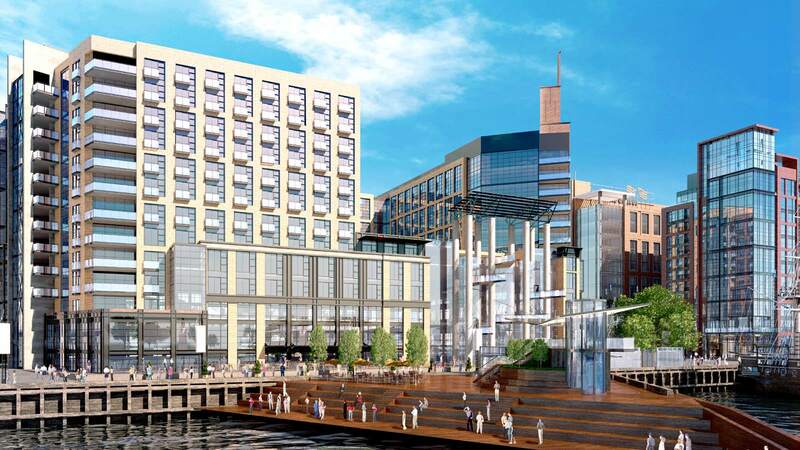 A side benefit of The Wharf is going to be a re-energized L'Enfant Plaza with a new Homewood Suites by Hilton hotel, a new office tower, and a renovated retail level.